PCLinuxOS has an abundance of applications and tools for audiophiles, disc jockeys, musicians, music producers, composers and anyone else involved in working with music. On my laptop, I have aTunes, Clementine, Audacious and Deadbeef for music players. 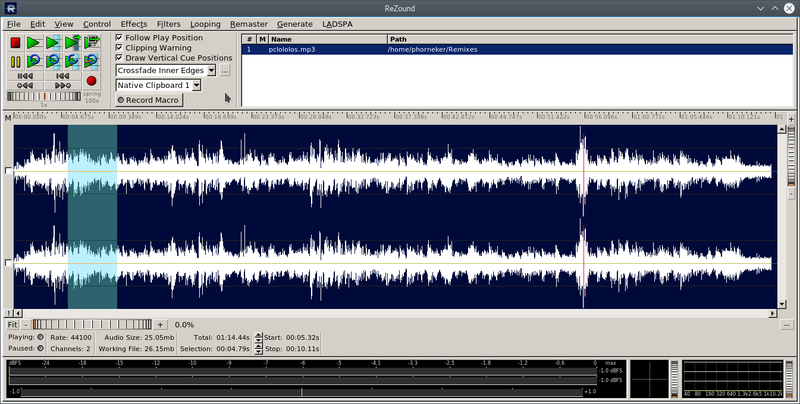 For editing, I have Audacity (the gold standard in audio editing applications), Mixxx and ReZound. When installed together, anything is possible when it comes to audio production. My music collection is quite diverse, not only in terms of genre, but literally spans decades (from the 1960s to the current decade). The idea of remixing music to create new pieces of music is no different from creating a fork of an application running on PCLinuxOS, composing a new photograph by manipulating elements of one or more original photographs, or even creating a new entree from leftovers in the refrigerator. The success of Free and Open Source software and Creative Commons licensing is attributed to this very concept, and is also a reason why we need to keep this concept going long into the future. Vaporwave is a very short lived example of an idea of remixing music. "an electronic music subgenre that originated in the early 2010s and spread over the next half of the decade among various Internet communities. It is characterized by a nostalgic or surrealist fascination with entertainment, technology and advertising of the 1980s and 1990s, and styles of both corporate and popular music such as lounge music, smooth jazz and elevator music." One could argue that vaporwave is a derivative of most music produced over the past century, in the sense that such music is manipulated in ways such that what is created is completely different from the original. But this definition can also apply to turntablism (which took its present form in the late 1970s), house music (which started in the early 1980s in Chicago), and chopped and screwed (which started in the early 1990s). While vaporwave compositions are slowed down in nature, the term vaporwave is derived from the term vaporware, that is any commercial hardware or software products that once were concepts but were never made available to consumers. Anyone can produce vaporwave compositions. 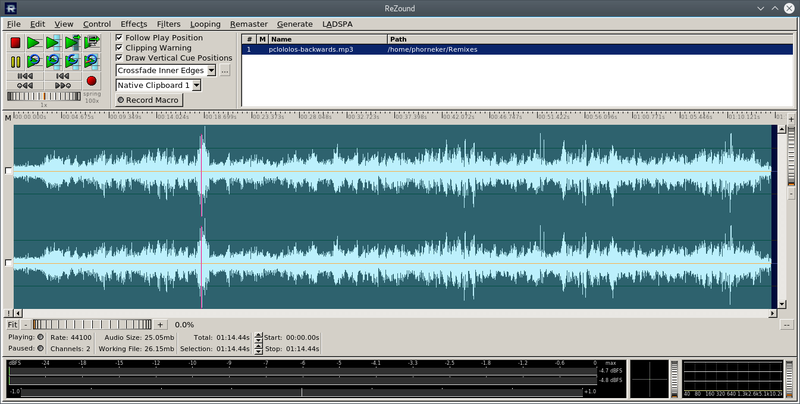 All you really need is Audacity (or ReZound) and a way to get your music into your PCLinuxOS machine. It is must a matter of slowing down each track you include in that composition. It is also a matter of making the result as aesthetically pleasing as possible. Because vaporwave is derived from so many genres of music, you could arguably use most any composition created since music was first recorded. Much of what the vaporwave compositions I hear (through YouTube) is derived primarily from commercial (read copyrighted) music. In this sense, vaporwave is a strong criticism of the capitalist system. I am no expert on copyright law, but there is an obvious issue here, namely that of copyright. However, I see where these artists are coming from, and their right to free expression. After all, there is a reason why we use PCLinuxOS in the first place. When it comes to popularity, vaporwave is a short lived genre. Just as breakdancing came and went in the early 1980s (I used to breakdance at that time at the high school dance in 1984 and 1985. ), vaporwave came and went just in the past few years of this decade. What I have been doing with music, is quite similar, in the sense that it is free expression. However, I choose to use Creative Commons licensed music and sound clips (including those published in this magazine) to create my compositions. By using CC and other compatible licensed material (including public domain), I do not have to worry about the legal and/or ethical ramifications of using such material. When playing a 33 rpm (or 45rpm) at 78 rpm, I called that "Chipmunk" music, named for the musical group The Chipmunks created by music producer Rostom Sipan "Ross" Bagdasarian (better known as David Seville), of which the voices were recorded at a slow speed then played back at normal speed. In contrast, playing a 33 rpm or 45 rpm record at 16 rpm (the speed of a Seeburg 1000 record) produces a low and slow voice that I call "bear music" to simulate the "voice of a bear." However, playing a 45 rpm record at 33 rpm (and vice versa) can produce a better than intended effect on the music. For example, playing Dolly Parton's "Jolene" (a 45 rpm record) at 33 rpm sounds like Neil Young singing "Jolene". Likewise, some DJs played Herb Alpert's "Rise" (the title track on 33 rpm) at 45 rpm, and it sounded just a great as the original (only faster). Reel to reel, cassette decks, and 8-track recorders/players (for those of you who remember that far back) can and do eventually malfunction. When they do, playback of those tapes will produce unexpected effects ranging from tape playback wavering in pitch and speed, to the actual tapes wearing down and producing muffled sounds coming in and out, and in the worst case scenario, tapes being chewed up by the player. To think that what was once tragic and expensive (and sometimes laughable) is now considered cool and artful. We can give thanks in part due to YouTube videos containing such content, and thanks in part due to new trends in music developed since the 1980s, where such trends involve repurposing of older music, in the form of remixes, scratching, beat juggling, beat matching, cutting, reversing, slowing down, speeding up, back spinning and chopping of music. Of course, this does not work for every piece of music, and to manipulate music in that manner at that time would lead to expensive repair bills on such equipment. A notable exception can be found in the movie High School High, where in the school dance, the disc jockey scratched up Glen Campbell's Rhinestone Cowboy. That song suddenly gained popularity because of the scratching. Thanks to applications such as Mixxx, Audacity and ReZound available in the repository, the effects from such music manipulation can now be simulated without having to take your high fidelity equipment to the repair shop. 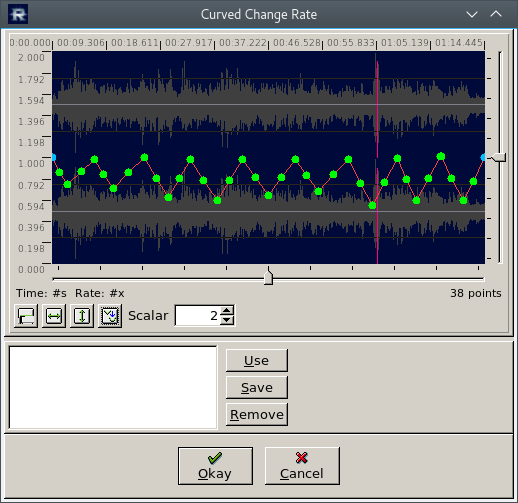 This editor has a function called Curved Change Rate, and is accessed from the Effects menu. With a sound clip loaded into ReZound, simply select Effects → Curved Change Rate, and a dialog box pops up with a graph. It is here where you graphically select points within the audio file where changes to the playback rate are indicated. For this example, I have ms_meme's "PClololos" loaded into ReZound. The original published track was recorded as a 22050 Mhz mono track. I remastered this composition as a 44100 Mhz stereo track. Now let us open the Effects menu. As we can see here there is a good selection of effects we can use on audio files. Change Rate is used to manipulate the playback speed of the entire audio file, whereas Curved Change Rate provides a fine tuned method where parts of the audio file are played back at different speeds within the same audio file. It is here where the magic begins. The graph in this dialog box affects the selection you are currently editing. Simply draw your graph inside the waveform shown. There are four buttons. The leftmost clears out the graph to a straight line. The middle two widen and lengthen the view of the selection respectively. The rightmost button automatically creates a smooth curve based on points you have selected in the graph shown below. You may also save your selections as a preset (by clicking on Save), then reuse the selection (with Use, replacing what is already in the graph) on another selection or track. The following below is an example of what you can do with Curved Change Rate. You can simulate a malfunctioning tape player by varying the playback of the file in a way that the audio slows down and speeds up at random moments throughout the playback. This simulation is graphically represented (as shown here) by randomly placing points on the graph window representing the audio file so a random waveform is displayed. Click on the right most button to create the smooth curve used for the simulation. Then click on OK to warp the audio file. Likewise, you can simulate starting up a turntable with the needle on the record by placing a point at the beginning of the graph representing a playback rate of zero. Then add some points in ascending order so you create a ascending curve that reaches the normal level. Simulating stopping of a turntable is done by creating a descending curve from normal to zero in the graph. 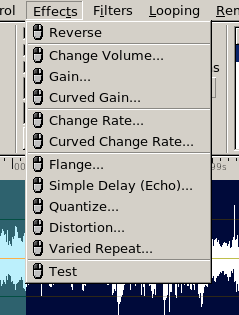 The sharper the curve, the quicker the effect will be when the audio file is played back. Likewise, the longer the curve, the longer it takes for the effect to be produced. This is useful if you want to simulate gradual stopping of a record on the turntable. If you create a waveform, and then end the graph with a zero point at the end of the file, you can simulate the tape player chewing up the tape. ...and if you want to look for subliminal messages in this file, selecting Effects → Reverse will reverse the audio file, so when you play the file, it will play backwards. Change Volume and Gain options can be used to fine tune the playback volume of the audio file. Curved Gain allows you to adjust the volume on parts of the selection or audio file, rather than the entire selection or file. Just what the name says. It is a virtual DJ console that does most everything the commercial product (read as expensive) Emulator 2 by Touch Innovations can do. 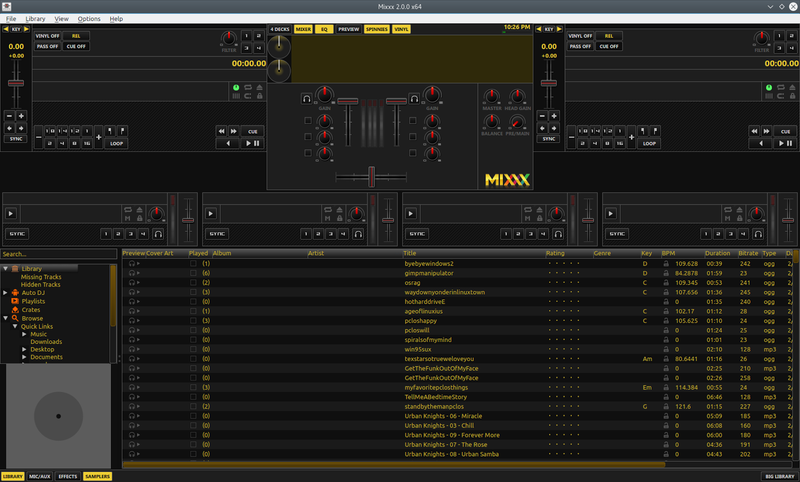 Mixxx can be installed from the repository, and once you start using it, you could imagine the possibilities of what you could do to your music. Before we get further into Mixxx, let us define some terms about music manipulation. Sample: A sample is a selection of audio generally short in length, but is used to define a sound as a musical instrument. That sound could be anything from a drum beat, to parts of Donald Trump's speeches, to cows mooing. Scratching: The act of rapidly moving forward and/or backward digital audio while that audio file is playing, usually in a rubbing motion or sudden movement in either direction, the idea being to make that audio a musical instrument. Cutting: The act of playing a sample on a turntable or CD deck, then pausing the audio at the right time. Usually, the audio to that turntable is cut off first, then the audio is reversed to the start point. At that time, the audio is restored, and the process is repeated. For example, I took a sample of Donald Trump saying "Great People" and morphed it into "Great People, Great People, Great, Great, Great People." Beat Juggling: What you are doing when you have two turntables (or CDJ decks) with the same music track loaded into each, cued up to the same point. With the crossfader at one end, the sample is played. At the end of the sample, the sample on the other turntable is started while you quickly move the crossfader to the other side, at the same time reversing the first sample to the beginning. At the end of the second sample, the first sample is started again, and the crossfader quickly switched to the other side on the mixer. Switching the crossfader quickly simulates a switch between the two turntables (or CDJ decks). The result is only the samples play in a fashion that resembles juggling, hence the term beat juggling. Backspinning: What you do when you quickly reverse a track while it is still playing. Likewise, quickly forwarding a track while the track is playing is called Forwardspinning. Reverse Playback: While not an official DJ term, it is what is accomplished when you click on the reverse button (next to the Play/Pause button) while the track is playing. Four sampler decks are available, not enabled by default. Two preview decks (only available when two turntables are active, instead of four), not enabled by default. Vinyl simulation is either Serato, Traktor or MixVibes style, and scratching is done with a DJ controller (simulating a turntable) or a mouse. Skinned themes with different control positions. Default here is called Late Night and resembles the Emulator 2 product. For this configuration, I have two virtual turntables configured Serato style for turntablism, four samplers for adding looping beats to the mix, and a repository of music stored on the hard drive. Freesound.org and ccmixter.org are two websites I like to visit for audio samples to use. If you have ever been in a K-Mart back in the 1970s through 1990s, much of the background heard in the store can be found at https://archive.org/details/attentionkmartshoppers. These digitized tapes average two hours in length, and is best downloaded to your local machine rather than streamed (especially if you have a low bandwidth connection). Downloading allows you to enhance the music for better enjoyment, as well as divide the track into individual tracks you can play separately. Also, the licensing of the taped to K-Mart called for destruction of the tape after the time period for which the playback tape was assigned had expired. Thankfully, this directive was not followed, or the music would not be available for our enjoyment today. Also included in this collection is a single tape (digitized from a reel to reel tape deck instead of cassettes from this collection) from 1973 which starts with the classic K-Mart jingle at that time. The music on this tape is the same type of music heard on the Seeburg 1000, whereas tapes produced in the 1980s and 1990s contained popular music of that era. There is also a Christmas 1978 tape containing the standard K-Mart advertising spots as well as special messages such as "Security to Section 3 please" designed to deter shoplifting. Shortly after I wrote the last article, seeburg1000.com upgraded its servers and again changed the access URL to http://74.82.59.197:8351/stream. The best way to keep up with the changes is to go to seeburg1000.com, click on Click to Play, then where it says Click on your favorite media player's logo, click on the first icon (representing Winamp), and allow your web browser to download playlist.pls and then launch the media player assigned to your web browser. For the official PCLinuxOS releases, that default player is Clementine. Like PCLinuxOS itself, their online store, http://seeburg1000.bigcartel.com/ has merchandise for purchase, of which proceeds fund the operation of the website and the playback of the music library. Merchandise includes apparel, CDs, and a vinyl record of Seeburg music. Seeburg1000.com merchandise can also be found on eBay for purchase. If you are lucky enough, there might be a real Seeburg 1000 machine for sale. The website located at http://www.nixiebunny.com/seeburg/ contains 10MB files of digitized Seeburg records available in MP3 format. The files here represent a small sample of what was available for the Seeburg 1000. The aforementioned sources are some of the music vaporwave artists used as the base for their creations. In theory, most any music ever recorded was fair game for this practice. The experiments I worked with for this article go beyond the concepts of vaporwave and house music. Once you start using these tools for audio file manipulation, imagine the possibilities of what you can do.